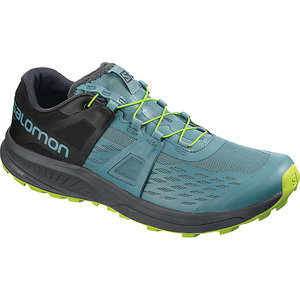 The Salomon Men's Ultra Pro Shoe is a high-performance trail running shoe designed specifically for long distance comfort. Dual Density EVA provides underfoot cushioning and helps control overpronation. Energy Savein the forefoot for a responsive toe-off while adding impact protection. OUTSOLE: Premium Wet Traction Contagrip offers non-slip traction for the toughest of trails. Endofit is a sock-like upper that yields unmatched comfort and fit. OrthoLite Molded Sockliner is composed of anti-bacterial material for reduced odor and moisture while adding cushion directly underfoot.